I posted photos from the Setrms 2006 fashion show previously here. This year, the show was held in Anakara on March 3rd. But get this - some of the models even wore wigs over their hijabs! i TOTALLY don't get the wigs. when i saw em I exclaimed: YOU'RE JOKING, RIGHT??? Ladies, please don't wear wigs, ever: in a very reliable hadith the Prophet S.A.W cursed the wearers and makers of wigs. I don't like these looks. However the D&G looks below combined with a hijab could just be AMAZING!!! I think the stylist must be trying to do a Muslim take on the practice of married Orthodox Jewish women to wear a wig, called a sheitel over their hair as part of the practice of modest dressing called tzeniut. There is a lot of debate in the Orthodox community about whether wearing a wig fulfills the rules of tzeniut so many Orthodox women wear a cap, scarf or snood instead. We should be aware as Muslims that the rules of hijab are different from the rules of tzeniut and that as a sister mentioned above, the wearing of wigs is discouraged for Muslims. loving the outfits, but not sure the wigs will become a fashion accessorie lol. I once read an article about a young university students in Turkey, who wear hijab. Since hijab is banned at the University, they have to wear a wig on top of the hijab part of university policy before entering the building. Even the young woman mentioned that she thought it was ridiculous, but since she wanted to wear the hijab, that was her only option. So, I wouldn't judge too quickly, because there are women in Turkey and other parts of the world who really struggle with their right to wear the hijab, and I applaud their efforts, even if it looks a little strange. anon I agree that there are women who have to do unusual things out of the desire to please Allah swt. A sister in France who had to stop wearing the hijab to go to school, shaved all her hair off so that the beauty of her hair wouldn't show. I sympathise with anyone who is restricted in their freedoms and I hope that religious freedom is something that we all have soon internationally inshallah. However anon, don't assume that we are judging the sisters who feel they have to wear wigs because at the end of the day this is a fashion focused blog so the response will be fashion based. Anon, we are not judging anyone. Had it been about a women struggling in a country that banned hijab that would be a different issue. But these models are just putting on a show, and so we talk about what they do in that context. Also, I don't quite understand how wearing a wig over the scarf would make it ok, since you could still see the scarf itself anyway? Moon, wigs are not haram, only those made from human hair are. Also, Anon 2 I deleted a comment you left here because I do not allow profanity on this blog. If you have something to say, please keep it clean! Hi, I have a lot of Turkish friends and the previous commentor is right - some girls in Turkey where wigs over their hijab so they can go to University. It is a little silly looking, but university officials look the other way and let the girls continue going to class even though they're technically breaking the law. Granted, the fashion show seems to have done a poor job of making the wig/hijab combo look stylish, but for many of the students, i know it's a kind of protest against the restrictions on their faith. ........thts sooooo hilarious......, the idea of the hijab is to cover the hair...whts hair doin over the hijab .........LOLL!! i like the styles! the woman models are so beautiful all covered up. i didn't understand the wigs until i saw these comments, i guess they were trying to make a joke during the fashion show...but not sure why? its not liek fashion shows are too serious or somthing.. haha.. I had no idea that students in Turkey had to do that. How sad for them. I was going to laugh about the wigs on top of the hijabs, too, but that just completely changed my mood. About the wigs it's true my turkish friends said they had to wear them to be able to enter any governmental place. So maybe the models at the fashion show were protesting in some form by showing the world what they have to do inorder to wear their hijab. So it is not just human hair but the idea of a;tering Allah's creation. Of course, I know it is a true story that Turkish women had to do this to accomplish many things. Allah S.w.t knows their reasons were not to alter His creation but to keep His commandments. The show IS making a protest. Alhamdulilah the ban has been revoked. N of course: "Allah has cursed the one who makes wigs and hairpieces and the one who wears them" (Fath al-Bari, 10:374). Some scholars disliked the joining of even synthetic and animal hair if it was completely attached and fitted to one�s own hair in a way that it is difficult to differentiate between the two, as it is a form of deception. However, many scholars permit it even if the wig or synthetic hair was completely fitted into one�s own hair. LOL Hayah I am not trying to argue or make something haram that isn't---it is just highly recommended that women refrain from using wigs and such becase the Prophet S.A.W wouldnt even let a woman who had measles and lost all her hair don one at the request of her mother. Of course, back then synthetics werent used to make wigs, so the hadiths don't differentiate on this though scholars might. Like prayer mats being made of natural fibres or not and the innovation that states one can only pray on natural elements---it is forgetting the context and the time and the reason intitially. this pictures are not fashion,a protest for our universitie's rules. in turkey, we HAVE TO uncover the head before entering the unversities, because this is a secular state. the higher education level is high in Turkey, 2of5girls are attending to universities, and the muslim population is 90% in total. think bout it, millions of girls can not use headscarfs in universities or can not go to university baceuse they wear headscarf. wearing wig is also not a solution, the struggle is being harder then in the class..
You'd rather have a researh, be informed before you name them as "ridiculous"..
some "laws" tryin to say us that "you shoul be uneducated if you are muslim!" Models are wearing wigs to show Turkeys law for girls wearing hijab.. we are not allowed to wear hijab and go to school.. we either have to take it off or wear wig. It migh look funny but its not at all! As you can see girl with wig and girl without hijab holding hands, saying they re friends.. they should be equaL... If you dont have any idea about Turkey , please dont make a comment. Does anyone know where I could buy something just like what they posted above? I'm really into the designs and I would like to buy some, but from where? anyones have a clue? 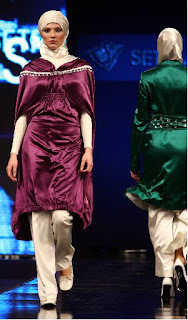 In this fashion show, SETRMS tell about the situation ın TURKEY about going universities with scarf must not cose a problem.You know who use scarf coul not educate in TURKEY.By the way SETRMS want to tell this problem. And also tell in the show there is no problem with the people who use scarf and the others.Please dont miss understand the fhotoes with wigs.